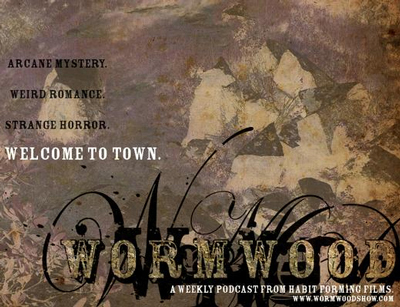 Wormwood: A Serialized Mystery is an award-winning, full-cast audio drama, created by David Accampo and Jeremy Rogers, which ran for three seasons. All 97 episodes are currently available on iTunes and at wormwoodshow.com. Wormwood has been featured in Rue Morgue magazine, as well as numerous programs, including Radio Drama Revival, The Sonic Society, Geek Cred, Double Dorkmeter, and Podcast Squared. Wormwood won the 2007 Uni Awards, hosted by The Sonic Society, sweeping all of the acting and production categories in which it was entered. Wormwood was also recently featured as one of the “Top Five Bits of of Sci-Fi Ear Candy” on furiousfanboys.com. “Wormwood is a wonderful commitment to audio entertainment on the web. Doctor Xander Crowe is a great creation, and I hope many adventures lie ahead of him. What can I say that other people haven’t already? I mean people have already said how incredibly good Wormwood is. People have already said how well acted, written, and mixed the production is. That Wormwood showed them truly the potential of what a modern audio production could be. Would you mind, if a person or group was to use a small amount of your productions music and dialog, in an incredibly small non commercial audio production, in a section that was a fan parody, and then clearly credited you and even suggested that people would be much better off listening to the incredibly good Wormwood. Or would you see it as a slight? Thanks, Brown Monkey. Sorry for the slow reply. I think it’d be OK, as long as it’s as you said: non-commercial production, a clear parody, and clear credits to the original show. And send us a link when it’s available!